By Jordyn Grzelewski | September 2, 2018 at 12:01a.m. Next to me, fellow fairgoers scream delightedly as they descend a hill on the Rampage roller coaster. In the distance, other amusement rides twist and twirl. I look out and see the Canfield Fair’s grandstand and race track, looking smaller from above. From my vantage point 120 feet in the air, the fairgrounds’ hundreds of food stands are indistinguishable from one another. For a few minutes, the elevation and gentle spinning of the wheel provide relief from the scorching heat on the ground below. This was my experience on the Dutch Wheel, one of about 50 new rides at the fair. After decades with the same ride operator, the fair board this year brought in Florida-based Reithoffer Shows, promising bigger and better attractions. The tallest of the rides is the giant Dutch Wheel, which brightens the nighttime midways with a light show. Next to it is the Rampage, which propels you around a curving red track, inches slowly up hills, then flies back down them as riders scream and raise their arms high. There is the Tornado, on which gondolas holding several riders branch out from the Tornado’s center and spin quickly around, music playing and bright colors flying past. On the Vertigo, riders sit in giant swings that rise and spin them through the air. The Starship 3000 promises a dizzying experience as riders stand against a wall and then are lifted from the ground by centrifugal force. During the many hours I spent reporting at the fair this year, every sign seemed to indicate the rides were a hit. On Saturday’s hot and sunny afternoon, lines to buy tickets stretched down the midways (if you plan to ride more than a few, think about investing in a $25 all-day ride pass). I saw more than one kid get off a ride, then excitedly run to get back in line for another turn. While most of those partaking in the thrills were children, many were accompanied by parents and grandparents who smiled just as wide and screamed just as loudly. “It’s just the right size for little ones,” Conrad said, and agreed it was “much better” than the rides he and his granddaughter experienced in previous years visiting the fair together. Both Isabella Helidonas, 11, of Canfield, and her mom, Heather Helidonas, were all smiles after they got off the Rampage. Like many others I spoke to, Heather agreed the rides were indeed bigger and better this year. 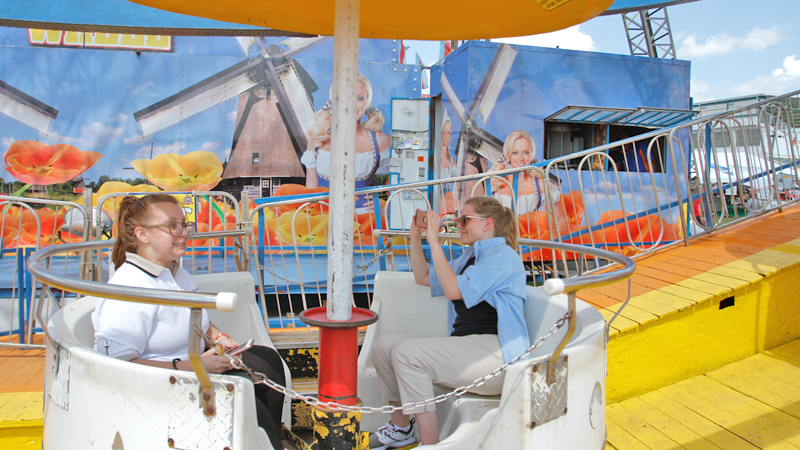 For her, the experience wasn’t really about the speed of the coaster, though, or its sharp drops – just like the fair isn’t really about the rides or the food or the exhibits or any one thing on the fairgrounds. For so many of the hundreds of thousands of people who continue to flock to the Canfield Fair, now in its 172nd year, it’s about the tradition and the company. Heather, for example, said she’s been coming to the fair since she was little, and now she brings her own kids. July 24, 2018 11:04 a.m.
August 30, 2018 12:01 a.m.